In early 2009, the Cambodian railway system was in shambles. A French company was brought in to repair the network of bridges, d eemed unsafe for travel. In the country’s second-largest city, Bat­tambang, bright red panels were affixed to either end of an iron train track, preventing passage over the Sangker river. Inconvenienced locals took matters into their own hands, re-opening the panels to lay rotting planks of wood onto the track, facilitating unstable and unsafe passage to the other side. For locals, it was a godsend. For any­one caught unaware, their lives hung in the balance. 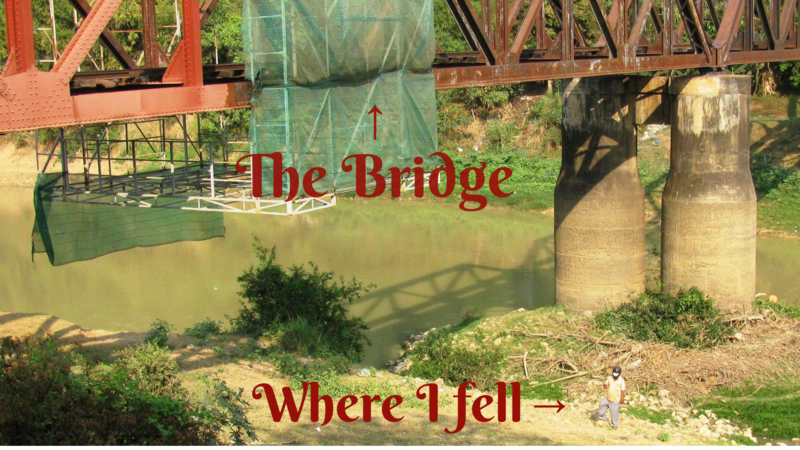 Locals had an explanation for unsuspecting foreigners who tumbled off the bridge towards injury or death; the river spirits were calling them. Ten years ago tomorrow, one day before Chinese New Year (of the Ox), I fell. That mighty spill dented my body—and stirred my spirit and soul—in ways I couldn’t then have foreseen. But, like a frail phoenix, I would rise again. I’d be lowered into the pool. I’d hobble into yoga class. I would learn to walk again. Then, I would set my aching-and-waking self on an odyssey of nearly 1000 klicks. I walked the Camino de Santiago; and regardless of the unseen bumps and messy spots that I encountered along the Way, every day I inched one step closer to the sun. Oh, how we imagine ourselves to be mighty. Infallible. Invincible. Immune from danger. In our hubris, we sleepwalk through a timeless fallacy; believing that we can blindly, unthinkingly, cross every bridge that appears in our lives, safely, untainted. But if we fail to notice signs hidden in plain sight; and if we don’t honor our submerged stories, we are doomed, one way or another, sooner or later, to ‘fall.’ It’s what we do with our respective tumbles and setbacks that matters. Find the seeds of your strength, nourish them well, and go on. My stories (submerged and otherwise) come to life in my upcoming memoir, about walking the Camino de Santiago, titled (Un)Bound, Together: A Journey to the End of the Earth (and Beyond). Stay tuned for news about a release, launch and other tidbits. Follow me also on Facebook, at: My Book: Unbound Together and Healing Pilgrim. You are amazing. I am looking forward to reading your memoir. Thanks, I’m looking forward to getting it into print and shipped out!! Wow, that was quite a fall. It’s funny, I am getting more aware of how the simple act of movement can become dangerous if we get caught up in the past or future, and lost to what’s happening right in front of us. I’m so glad you healed, walked again, and walked far! Thanks for intuiting what was going on…and for the reminder! Yes, I do love long walks! Another long walk is planned for later this year – in Italy, to raise funds for EMERGENCY, the NGO that saved my life. Blessings..